Life longevity is adding to an already major income gap between what most retires will need and what they are able to save. American workers today are living longer, which is certainly great news. But that longevity is adding to an already major income gap between what most retirees will need and what they are able to save. Bridging that income gap is at the heart of a new book published last month from the Center for Retirement Research at Boston College, “Falling Short: The Coming Retirement Crisis and What to Do About It.” Co-authored by Charles D. Ellis, Alicia H. Munnell and Andrew D. Eschtruth, the book examines a number of solutions for the looming retirement crisis. Using both hard data and anecdotal evidence about retirement preparedness in this country today, the authors note that workers can expect less from traditional income sources in the future. That puts the burden on individuals to save more now and tap home equity later; on the government to shore up Social Security; and on employers to offer fully automated 401(k) retirement plans. Retirement Wire spoke with author Andrew Eschtruth about the center’s findings, and on what the three see as conceptually simple and eminently feasible solutions to the retirement savings problem. 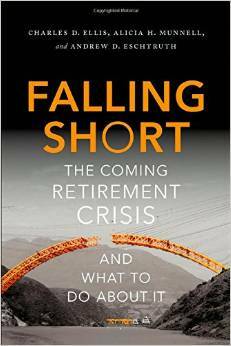 Retirement Wire: What was the motivation for writing this book? Eschtruth: The motivation actually existed before we got the idea to put it in a book. This really captures a lot of the research and findings and insights that we’ve been generating here in our center over the past 10 years. In some ways it’s been many years in preparation. We’ve been studying retirement security at the center for many years – we were started in 1998 – so for the past 16 years we’ve been studying issues related to the income security of the retired population. There are a number of trends that concern us, and those come out in this book, as well as some solutions that we think would make a big difference. Retirement Wire: What are some of the key retirement trends that you identified? Eschtruth: The retirement landscape has been shifting over the past decades in a very dramatic way. That is systematically shifting more risk and responsibility away from institutions like government and employers and on to individuals for managing their own retirements. Some of these involve broad demographic and economic shifts. We like to characterize them in two ways: (1) people will need more retirement income in the future than today’s workers; but (2) they are expected to draw less support relative to their earnings from traditional sources of income like Social Security and employer pension plans. Retirement Wire: Is it due to longer life expectancy that they will need more earnings? Eschtruth: The reason that the need for retirement income is increasing is partly due to longer life expectancy, partly due to rising healthcare costs, and partly due to today’s low interest rates — which are expected to continue for a bit. Low interest rates require you to have a larger nest egg in order to generate the same income at retirement. That’s why the interest rate is relevant. In terms of the changes in the sources of retirement income, changes in Social Security under current law is expected to provide a smaller share of a worker’s retirement earnings than it has for current and past generation of retirees. There are a few different reasons for that. The first one is that the programs – what’s called the full benefits retirement age has been in the process of increasing from age 65 to age 67. We’re in the middle of that transition right now. But when you raise the full benefits retirement age it is equivalent to an across-the-board benefits cut, no matter what age people claim it at. It has the effect of reducing the amount of Social Security benefits relative to what you earned while you were working. People are looking to replace a certain share of what they earned while they were working, so they can maintain a similar lifestyle when they retire. That is the thinking behind the analysis. Social Security is shrinking partly because of that across-the-board benefit cut and partly due to increases in Medicare premiums, which are typically deducted directly from your paycheck before you get your benefits. The size of the check you see is shrinking relative to your retirement earnings because of this increase in Medicare premiums Part B and Part D.
Another reason is that more people are subject to taxation from the income tax system on a portion of their benefits. When the law was started [in 1983] only a small percentage of people were above the income thresholds. But they are not adjusted for inflation or wage growth. So over time, due to real earnings growth and due to inflation, more and more retirees are retiring with incomes that exceed the thresholds. Today roughly 35 percent of workers pay income tax on a portion of their Social Security benefits. That number is increasing gradually over time so that by 2030, with no changes in law, we’d expect more than half of the workforce would be subject to taxation on their benefits. That’s another way in which the ability of Social Security to replace your preretirement earnings is going down over time. I have not even talked about the long-term financing imbalance in the Social Security program so there could be further changes in benefits depending on how policy makers address that. The pension side is a quicker story. We had traditional defined benefit pensions. Those have mostly gone away in the private sector. In their place we have essentially the 401(k) plan, which could work just fine and has certain advantages over the defined benefit plan — specifically in terms of portability, when you move from employer to employer. But in practice people have made decisions that every step along the way has undermined the ability of the 401(k) to provide substantial retirement income. Today’s 55 to 64-year-old with a 401(k) has only about $111,000 in combined 401(k) and IRA assets. That may sound like a lot to some people, because it usually exceeds their annual income. As a nest egg to supplement your Social Security over two or three decades it’s actually not very much at all. Retirement Wire: Did you look at the impact of great recession and the bad economy of the last few years and what that did to people’s contributions to 401(k) plans? Eschtruth: We didn’t look specifically at that. We’ve done other research at the center obviously interested in the effects of that change. Our take is that it may have accelerated a lot of the problems that we’re concerned about for future retirement security. We’ll see the kinds of problems that we’re worried about develop earlier than we initially thought, partly because of the effects of the recession. But we don’t do any quantitative analysis on how things have changed. I can give you one indicator. We have something called the National Retirement Risk Index that was developed by our center. It is a single number that measures the percentage of workers who are on track to replace their pre-retirement income and maintain their standard of living. We showed that between 2007 and 2010 — just before the recession and while it was in slow recovery — that the percentage of households at risk went from 44 to 53 percent. And we’ve done a very recently analysis that showed that number only dropping down to 52 percent in 2013. From that standpoint, there has been a shift upward with more people at risk. The stock market has done very well obviously for several years now. Stock ownership is still fairly heavily concentrated in this country, so that the bottom half of the population doesn’t own a lot of stock so they’re not seeing a lot of equity gains. They do see some gains on the homeownership side but house prices have not come anywhere their pre-recession peaks. Retirement Wire: How about any other key trends that you found? Eschtruth: One trend that really hasn’t changed a lot is that outside of 401(k)s and IRAs people essentially have no other retirement savings. Partly because of that we think it’s worth considering whether to tap your home equity in retirement to help support your day-to-day consumption. That could include either moving to a less expensive house or it could be taking out a reverse mortgage. Neither of these has been that popular. When older people move they usually move to a smaller place, but they don’t necessarily move to a less expensive place. Very few people take a reverse mortgage today, but we think that it’s a product that will increasingly be more salient as people don’t have enough from other income sources. Retirement Wire: Did your research find significant differences between people that work for employers that offer some sort of retirement plan versus those that don’t in terms of their overall preparedness? Eschtruth: Actually that’s an excellent point. There is a huge coverage gap in this country where — if you’re looking at the private sector workforce — only about half of workers between 25 and 64 are participating in a 401(k) or a traditional pension at any given time. That is a big coverage gap that has us concerned. Specifically to what you just said, we did a breakdown in our latest National Retirement Index and what the percentage of households at risk was by their pension coverage. For people who had no pension coverage (remember I told you the overall average was about 52 percent of households at risk), if you don’t have a pension that rises to 68 percent. Retirement Wire: Was there anything that really surprised you in current retirement trends? Eschtruth: A lot of this stuff we have been talking about and writing about for many years. So in that sense there weren’t any big surprises. I think the thing we weren’t really sure about was exactly what the right mix of solutions for this challenge was. We had considered different ways to deal with the low savings rates in 401(k)s and coverage issues. We ended up deciding that we wanted as much as possible to build on the existing retirement institutions and not try to say start from scratch and create a whole new retirement system. We decided it was more feasible that way, to propose solutions that worked off of existing programs. You still need to have a new type of retirement savings account to cover all these people who don’t have access to an employer 401(k). But that is just a gap that has always been there. Retirement Wire: What are the top solutions that you advise to ease the coming retirement crisis? Eschtruth: Given the trends that I told you before about how these replacement rates within Social Security are shrinking, our concern is that they not shrink further, or very much further. With the program’s long term financing imbalance we would recommend relying more on revenues than benefit cuts. If you did have further benefit cuts you would essentially have to make that money up somewhere else anyway. People would have to save more in their 401(k)s. Shoring up the program is an important goal and it would also improve confidence in people that they have this foundation in place. Another big recommendation is to do something to the 401(k) system so that people who are in the system already are both more likely to participate in the plan and to put more of their money away for the future. The best way we thought of doing that is to build on the successful experiment of using these automatic techniques – automatic enrollment; automatic escalation in the contribution rate; and a number of companies have adopted over the past decade or so. We would like to see those spread even further. We would want every company with a 401(k) to automatically enroll their workers, and workers would still have the option to opt out or change at any time. But to make sure everyone is in an automatic enrollment plan and a plan that escalated contributions over time. We think it should be required by the government that everyone with a 401(k) to be in an automatic plan. We don’t propose anything like mandatory participation. We also look to different mechanisms for people that don’t have a plan. Increasingly states are beginning to experiment – in the very early stages still – with their own ways to offer private coverage to private sector workers within their states that don’t have private pension plans. California is doing something in this regard. Other states are considering something. Nobody has a system in place at this point. We think achieving that sort of universal ability to participate in a retirement savings plan is important and we would recommend using some sort of default like an automatic enrollment process.